Ducks are an entertaining and relatively low-maintenance addition to any homestead. They may make a mess with mud and water, but they are generally charming, hardy against the elements, and prolific layers of rich, delicious eggs. Once you’ve decided to keep ducks and picked a duck breed, it’s time to build a duck coop. How many square feet do you need per duck? The size of the structure will ultimately depend on how many ducks you have. You need between 4 and 6 square feet of floor space per duck in the coop, and around 16 square feet of outdoor space per duck. Tim Wilson, who raises the fowl at the Common Wealth Farm in Unity, Maine, said that if you plan to keep the ducks in the structure all winter, each one will require 25 square feet of space. Even then, he suggests housing the ducks at night and letting them outside during the day. “Ducks will go out in the snow unlike chickens and they will go farther than you think,” he said in an email interview. Once you have the floor plan laid out, your ducks will also need a decent sized door, ideally one that is big enough for two ducks to pass through side by side. A 14 by 14 inch opening is a good start, but the size may need to be adjusted for bigger breeds. 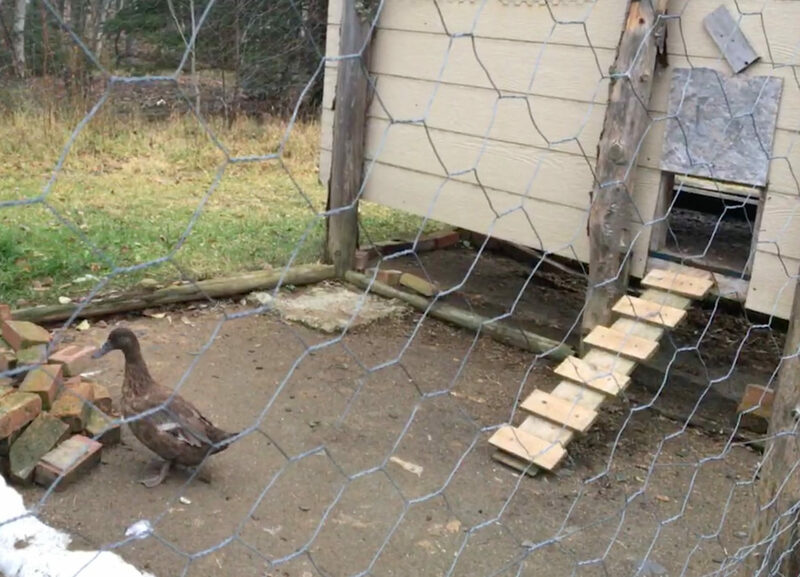 Can ducks and chickens live together in the same coop? “Chickens like to pick at the ground and ducks will make the ground very wet,” Wilson said. Once you know how big to make the coop and its opening, you can use lumber, plywood, and siding to construct a coop to your exact specifications. There are many different plans online with different styles, but there are a few key considerations to keep in mind. If you don’t make a coop that is big enough for you to walk into, don’t forget an access door for people to clean and replace bedding on the side or roof. Add bedding to the bottom of the coop for ducks to nest; straw is generally considered the best, but hay and wood shavings have their advantages as well. In general, ducks are hardy creatures, so coops do not need to be sealed air tight from the elements. Any crevices or gaps in the walls can be used for ventilation, which is an essential element to any good duck coop: ducks’ breath is laden with moisture, and wet or soiled bedding can mold and damage the ducks’ respiratory systems. In the same vein, peel and stick vinyl tiles on the floor and a few feet up the walls might also be handy to make cleaning easier and keep the wood from rotting. Ducks love playing in water, but they do not need water in their enclosure for bathing. In fact, John Metzer, owner of Metzer Farms in Gonzales, California, which specializes in farm fowl, recommends keeping as much water out of your indoor enclosure as possible. “Give them swimming water once or twice a week with a little pool, but don’t need all the time,” Metzer said. Another tip for keeping the coop dry: mount drinking water on a wire platform. “The spilled water goes through so the ducks can’t play in it and turn into mud” Metzer explained. Finally, predator-proof your duck house with secure window openings covered with hardware cloth wire mesh (it is more secure than chicken wire, which is easily broken into by egg-thieving raccoons). At night, either keep them in a closed coop or a securely fenced duck pen that can keep unwanted critters out. As much as you enjoy your ducks, foxes and large birds will enjoy them even more; a secure enclosure will keep your ducks out of their natural predators’ clutches. I have purchased outdoor lights (solar) to install around the duck run. Will it disturb the ducks to have them on all night? Hi, Nancy! Great question. Our expert contacts out at Metzer Farms informed me that your outdoor solar lights will, for the most part, not disturb your ducks. They might lay fewer eggs than without the lights, but there will be no detrimental health effects otherwise. Hope this helps!